We have a decently healthy herd here at Infinity Farm. We are eight species strong- mostly horses, but our fair share of ruminants as well. Sometimes you can pick up a sick vibe in the herd before you can figure out which animal it is. It’s almost like sensing it out of the corner of your eye. This week it was a llama. Her real name is Belle Starr, but she is a big boned girl and it’s hard to not refer to her as the Belly Llama. She had a bit of a digestive upset that I was able to set right with a minimum of syringe wrestling. She’s fine now, but I got to remembering her little sister, Clementine. This is a pre-digital era photo of Clemmie- one day old and in the shade of her mom. 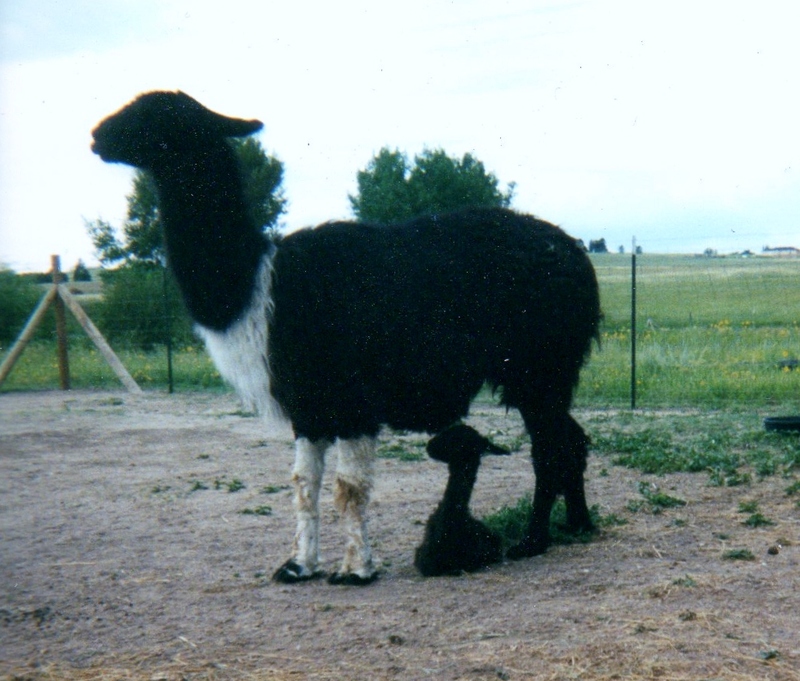 She was an especially tall, big, and strong cria. Just in case it isn’t obvious looking at her. Clementine was smart and so strong, that when she was two I started training her to drive. Clemmie was a natural. By the time Clemmie was three, she started losing weight. It wasn’t so noticeable at first, but the more I tried to get weight on her, the more she lost. I have a good llama vet; we did a series of tests. All of her numbers were good. The vet said that if she hadn’t seen Clemmie, she would say she was the healthiest llama around. Over the next year, Clemmie got very frail. Nothing we tried helped, but the vet didn’t think she was in pain. Everyone in the herd was gentle with her, so I just let her have time. You know this part: One day she seemed different. Clemmie didn’t want to eat and she couldn’t balance to stand. The other llamas were staying close. I thought this might be the day, and made the call for Clemmie one last time. The llama vet promised to come as soon as possible. An hour passed. Clemmie struggled to hold her head up, but it was harder for her to breath if she laid it down. I sat down and held her head so she could be more comfortable. No vet yet, but the horses had joined the other llamas, all standing quietly, watching Clemmie. Another hour passed and no vet truck yet. Clemmie was breathing easier with me holding her head, but not improving. Now the goats and donkeys had joined the horses and llamas holding vigil. The dogs were laying down and watching from a distance. Everyone was in a respectful circle around me and Clemmie, waiting and breathing. We were at peace. “The most precious gift we can offer others is our presence. When mindfulness embraces those we love, they will bloom like flowers.” – Thich Nhat Hanh. Another half hour and the dogs don’t bark, but I finally heard the truck. My vet hurried over and confirmed what all of us knew. In a kind moment, Clementine was released. There might have been a collective sigh but it was probably just me. Eventually, one by one, the herd began to wander away. Some sniffed Clemmie. The llamas stayed close to each other. My grandfather horse was the last to leave. Clementine had a little life, gone several years now. Do they ever remember her? The herd circle still comes together for special occasions, like the full moon night Clara was born. Life in our herd goes on, ordinary and special at the same time. I keep thinking about The Cambridge Declaration on Consciousness signed this summer by a prestigious crowd of international scientists. There are some very big words explaining that with the advent of better technology, scientific evidence is increasingly showing that animals are sentient. Scientists have proven that most animals have conscious states similar to humans. Lately, I wish humans had conscious states more similar to animals. But it’s an election year. Know what I mean? Made me cry again. So sweet . Your writing is so heart felt and passionate. Thank you. Thank you, Nikki. Thanks for reading. I hear what you’re saying. Great post. Thanks. Sometimes our species is a bit disappointing. I felt sad that Clementine passed away at a young age but I also felt happy that from the day she was born to the last hours, she was surrounded by love and care. And this one holds so true and I had seen in so many times, ““The most precious gift we can offer others is our presence. When mindfulness embraces those we love, they will bloom like flowers.” A lot of times, when a friend and a family is in pain, or in grief, the best thing we could do is to just be there at their side , letting them know that no matter what , we are there for them . Beautiful post. Beautiful post. It’s hard to watch a beloved animal be in pain and pass on. I’m sorry for your loss. Clementine was lucky to have lived with people who loved her. Outstanding, heartfelt, and so wise…I’m sad/happy all over again.